November 22, 2010. 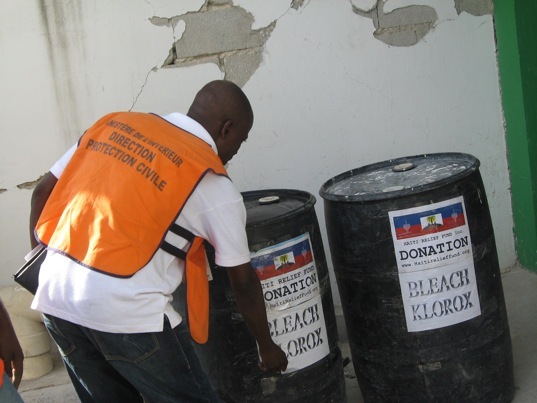 Inspection of Haiti Relief Fund's donation of 2 barrels of bleach to Hospital L'Universite D'Etat D'Haiti in Port-au-Prince with an inspector from de Ministre De Linterieur Direction Protection Civile oversees the donation. November 22, 2010. Staff members of Haiti Relief Fund's donation. 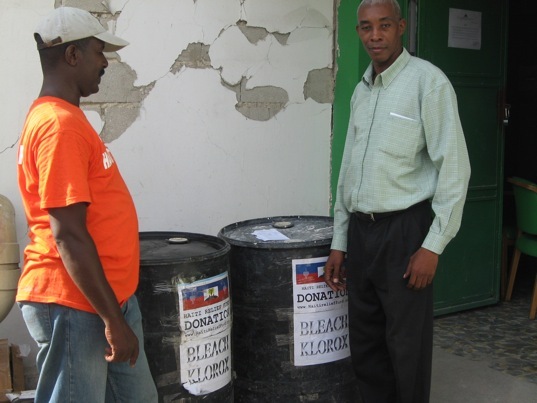 Deliver 2 barrels of bleach to Hospital L'Universite D'Etat D'Haiti in Port-au-Prince, Haiti. An inspector from de Ministre De Linterieur Direction Protection Civile oversees the donation. November 22, 2010. Mr. Allain Demesier from Haiti Relief Fund and Mr. Zilien Andrice, magasinier of the Hospital L'Universite D'Etat D'Haiti Port-au-Prince Haiti. The Hospital was in need of bleach to help fight Cholera. Haiti Relief Fund is helping to bleach Cholera out of Haiti. As health care is vitally important for the people of Haiti, Haiti Relief Fund is committed and dedicated to help all public hospitals in Haiti by distributing donated medical supplies and equipment to public hospitals and clinics in need throughout Haiti. You can learn more about Haiti Relief Fund's efforts in rebuilding health care in Haiti by clicking HERE. We are in need of medical supplies/equipment, pharmaceuticals and items that can help a hospital or clinic serve its community better. 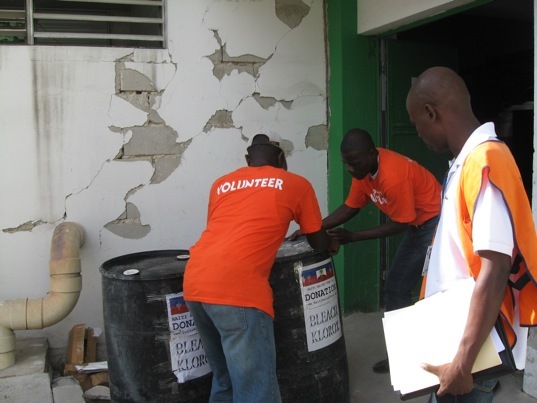 Click HERE to see HRF at work with Haiti's Hospitals. Haiti Relief Fund, Inc. is a registered 501(c)3 Not For Profit Foundation of the Internal Revenue Code, classified as a Public Charity. All donations to Haiti Relief Fund Inc. are fully tax deductible. Financial contributions are vital in providing help to those in need. Your annual support of any size will help us provide the children of these impoverished communities with a free education, available to all children. School consists 7 Teachers, a Director, 7 furnished classrooms and a Directors room. Contact HRF for more information.